The main keynote address at the Arise conference focused on unpacking the client of the future, Generation Z. Delegates were afforded greater insight into the characteristics and mindset of this new generation, which is set to disrupt the banking sector as we know it. 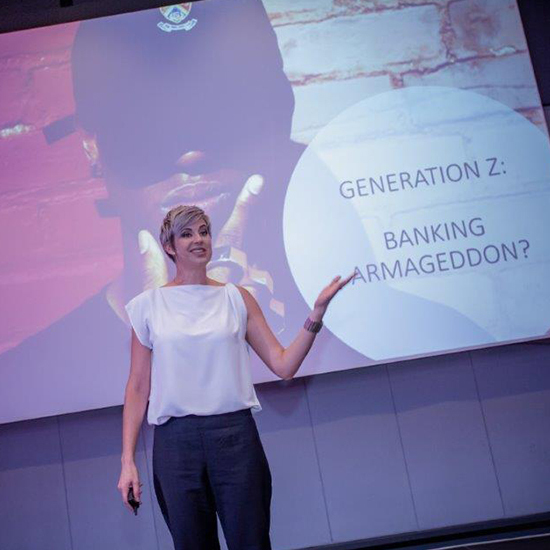 According to trends futurist, Juanita Vorster, retail financial institutions will need to start building relationships with consumers, while they are still young, or they risk missing out on opportunities to help shape their financial perspectives, while building brand preference. The development of fintech (cryptocurrencies, blockchain, shared economy) and new payment methods have resulted in new generations reconsidering how they access financing, who they trust to provide them with advice and who they trust to keep their earnings safe. Some unique characteristics of Gen Z’s that financial institutions need to be cognisant of is that this generation is more likely to think for themselves and not believe authority figures. They see technology as a given, not a goal and consider mobile banking apps essential as they want instant convenient 24/7 access to information and their money. They are driven by social considerations and their financial decisions are based on the impact it will have on society in general. Another key trait that defines this generation is that they are savers. Gen Z are comfortable not owning anything and prefer to “pay to use” as this is more sustainable. They are completely comfortable with using their smart devices to hail a ride from a complete stranger, or even share a home with strangers and stay in touch indirectly via social media. As a result, they do not have the same loyalty to purchases as previous generations. They are not brand loyal and are quick to select a new service provider to find a better deal once the “use they paid for” is up. So how can banks gear up to service this client of the future? Banks can cater to their needs by offering easy digital and mobile first applications for new accounts and finance assistance. This generation does not want to visit a branch and banks need to find innovative ways to provide them with information and assistance wherever they are. It is essential that information is presented in new and surprising ways to make an impression. Short bursts of information, which can easily be shared via social networks will be more effective than long-form content that requires extended concentration. Banks will need to reinvent themselves and make their services available on digital channels. They will need to find innovative ways of educating clients about digital channels and pricing digital transactions attractively compared to those in physical channels. They will need to provide rewards programs for increased use of digital channels. End-to-end digital transformation will result in a significant upgrade of customer experiences and contribute to a radical reduction in costs. Banks must realise that consumer trust is a currency for financial services that can only be gained from instilling a culture of putting the customer first. To achieve this, banks need to first meet Gen Z customers where they are in terms of their lifestyle and needs. Fixated with convenience, this generation will continue gravitating towards brands that provide the best personalised data-driven user experience, value, and ultimately, the best means to reach their financial goals. To remain relevant in the future, banks will need to evolve from being service providers and become trusted enablers and partners in the lives that Gen Z designs for themselves.